Description: Male red golden pheasants are very colourful with a golden yellow head, bright red breast and body, yellow ruff or cape edged in blue-black, green back, yellow rump and red and blue wings. The female of this small pheasant species is a blend of brown feathers with buff bars. There is a colour morph of red golden pheasant known as the yellow golden pheasant in which the male is predominately yellow, with any other colours muted or non-apparent. 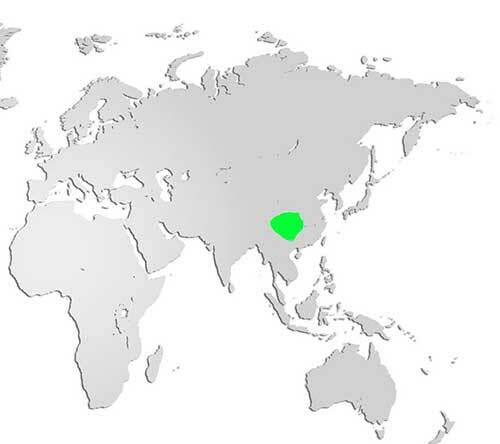 Distribution and Habitat: Native to the forests and mountains of Western China. They are a popular bird in captivity and it is believed that George Washington may have kept some. A few mutations have been developed through captive breeding. Diet: Their diet is mostly grains and greens but also includes insects. Life Cycle: Breeding season begins in April with males displaying by fanning out their ruff to win females, though they’ll often display when there is no female around. The males are often fertile in their first year but don’t completely get their colourful mature plumage until their second year. The female lays an egg a day until she has a clutch of 8-12 which she then incubates for 22-23 days. Chick gender is easily determined as male chicks have darker brown eyes. Did you know? 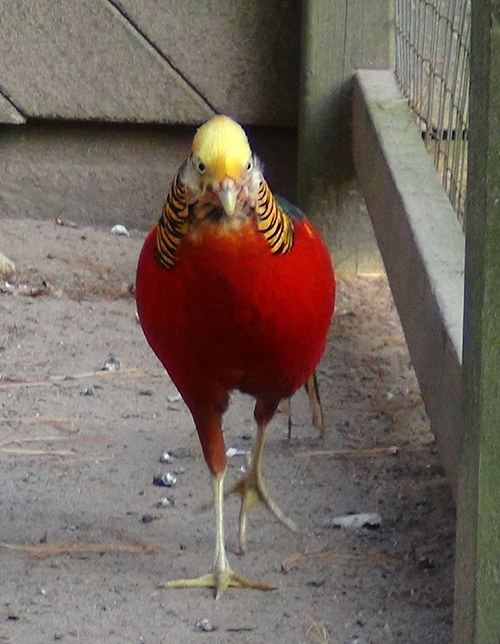 Popular as a captive bird, the red golden pheasant has been introduced to the wild in some areas, and there are feral populations in some areas of the U.K.